What Is the Meaning of Statutory Deductions? What Is the Maximum Percentage of Pay on a Garnishment? Employers make deductions from employees’ wages either on a statutory or voluntary basis. A voluntary deduction is one that the employer offers and the employee accepts. A statutory deduction is one that federal or state law requires. Statutory deductions take various forms. The calculation varies by deduction type. Statutory deduction applies to the federal payroll taxes employers are required to withhold from employees’ wages -- specifically, federal income tax, Social Security tax and Medicare tax. It also applies to state payroll tax deductions, such as state income tax, and wage garnishments and child support withholding orders. A wage garnishment can be court-ordered or issued by a federal or state institution, such as the IRS or the state taxation agency. The employer is required to withhold payroll taxes from all employees’ income, unless the employee qualifies for, and claims, an exemption. The employee can claim an exemption from federal income tax withholding if in the last year she was entitled to a refund of all federal income taxes withheld because she owed no taxes and if in the present year she expects a refund because she anticipates owing no taxes. The employee claims the exemption from federal income tax on her W-4 form (see Resources). She claims an exemption from state income tax withholding according to her state revenue/taxation agency’s guidelines. The employer calculates federal income tax withholding based on the employee’s filing status and allowances (as stated on his W-4) and the IRS Circular E’s withholding tax tables. It calculates Social Security tax at 6.2 percent of gross income, up to $106,800 yearly, and Medicare tax at 1.45 percent of all gross income. It computes state income tax withholding according to the respective revenue agency’s policies. 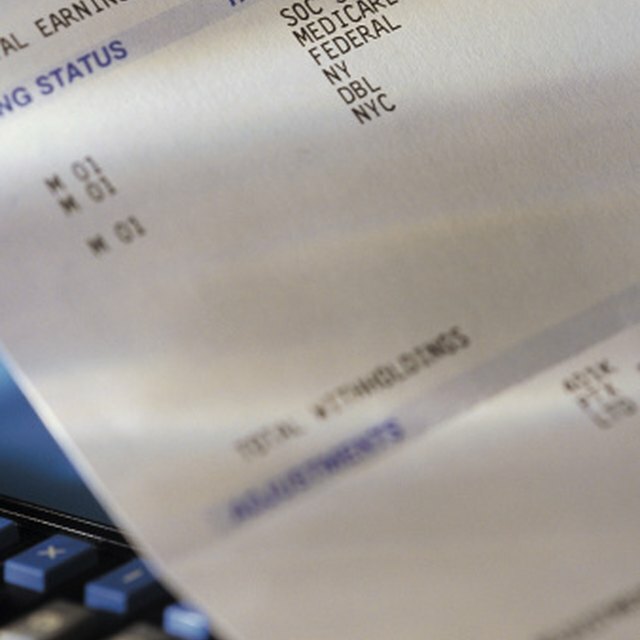 The employer can deduct up to 25 percent of disposable wages for a wage garnishment during a single pay period. For child support and alimony withholding, it can deduct up to 50 or 60 percent, plus an additional 5 percent for support payments more than 12 weeks late. Disposable income is the employee’s wages after taxes and pre-tax voluntary benefits are deducted. How Much Does the Government Tax a Paycheck? The employer pays federal income tax, Social Security tax and Medicare tax withholding to the IRS. It pays state income tax withholding to the state revenue agency. In the rare cases where local or city income taxes apply, such as Ohio’s school district income tax and Yonkers city income tax, the employer pays it to the respective agency. The state revenue agency typically lists the city and local income tax guidelines on its website. It pays wage garnishment, child support and alimony withholding to the issuing agency listed on the garnishment/support order. The employer cannot stop a wage garnishment or a child support or alimony withholding order prematurely unless the issuing agency tells it to. The withholding generally ends when the employee has paid off the debt or wins an appeal, which can stop the garnishment temporarily or permanently.